XTatlas™ is a full motion video (FMV) exploitation software application for use with Small Unmanned Aerial Systems (SUAS), piloted aircraft and UGV. XTatlas, developed by XTEK, provides real-time, accurate geo-referenced video mapping; and near real-time creation of mosaic maps and 3D models from FMV. The FMV, mosaic maps and 3D content can be analysed by users to provide actionable intelligence for the warfighter. Utilising a STANAG 4609/MISB ST 0601.8 compliant high definition video feed and ground control system (GCS) with the XTatlas™ application installed. The live video and geolocated maps can be transmitted over a network for viewing at a remote command post. XTatlas grants the UAS operator situational awareness of the area in which the mission is conducted. 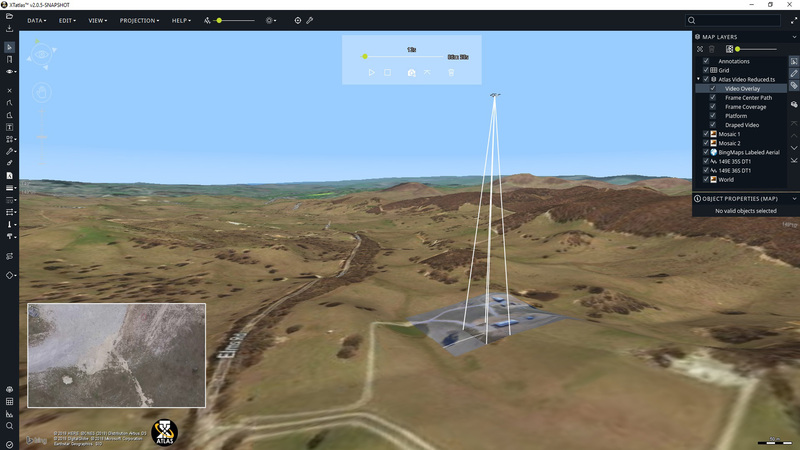 Background imagery can be utilised from sources such as satellite maps or any georeferenced image. If the imagery of the area is unavailable, a mission can be conducted to create new imagery. This technology is not limited to Defence and law enforcement use and provides a situational advantage for many instances that require rapid accurate mapping, such as search and rescue, firefighting and disaster response. Other possible applications for this technology include, but are not limited to, surveying, agriculture, farming, and asset inspection.